I saw a post on Facebook the other day saying that the huge patch of garbage that is stuck in the Pacific Ocean is now twice the size of Texas. And let me tell you, after living here, Texas is a massive state! I can’t even begin to imagine that much garbage all in one place. Every bit of plastic ever made still exists somewhere. While it may be an exaggeration, or it may be true. Either way, this is a problem. This is a big problem. In our house, we have been trying very hard to reduce the amount of waste we produce throughout the entire home, but the kitchen is the biggest producer of trash. We’ve already worked on a few ways to reduce waste in the kitchen, but there is always room for improvement. 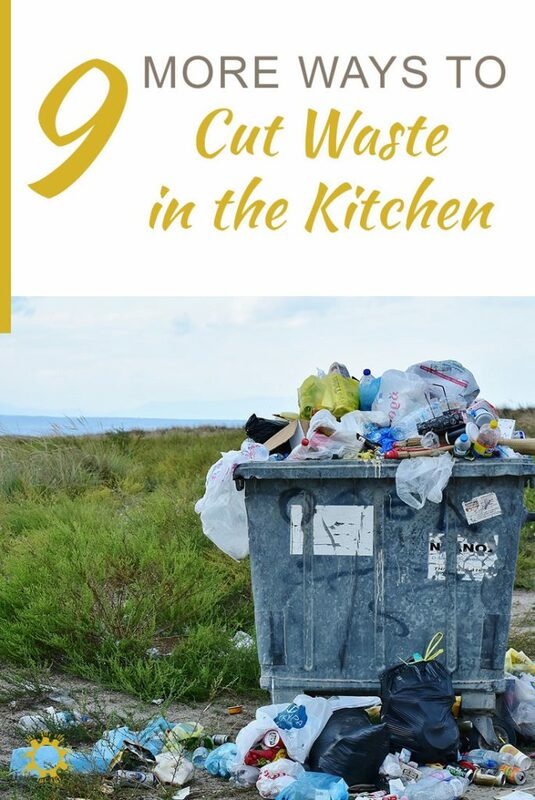 I’ve gathered ideas from other bloggers on ways we can all lower kitchen waste. We’re all guilty of buying chili powder for that chicken chili recipe only to get home and find out we have 3 more just like it in the pantry. Not to mention filling our crisper drawers with tons of beautiful strawberries, lettuce, and cucumbers, then realizing a week later you forgot about them. Oy vey! It’s all money down the drain! Literally. I learned that approximately 1/3 of the food that is produced in the world gets wasted. That statistic to me was appalling. How do we have hunger in this world, if we are wasting that much food. It’s mind blowing really. I’ve done my best in ensuring our family wastes as little as possible. For the foods we do have to waste, I try to compost as much as I can back into our garden for the next year. Today, I wanted to share some tips with you about how we work on wasting less. I honestly thought I was doing my part to save the earth by recycling everything I could. Not until someone pointed it out to me did I realize that recycling is the 3rd R in the 3Rs. One should Reduce first, then Reuse next, Recycle last. Then I learned about that zero waste family in California with trash that fit in one small jar! From Bea Johnson’s blog and book, Zero Waste Home, I learned the 5Rs: Refuse, Reduce, Reuse, Recycle and Rot (Compost) in that order. When you think about it, it makes sense. Refuse what you don’t need, reduce what you do need, reuse what you can, recycle what you can’t refuse, reduce or reuse, and rot or compost the rest. In celebration of Earth Day later this week, I’ve decided to share with you a sustainable recipe for homemade slow cooker bone broth using leftover kitchen scraps! It’s the perfect way to use up all of those “butts” of vegetables, chicken carcasses (in case you have a few lying around) and other kitchen scraps that you would probably throw away normally. I like to think it helps me do my part to reduce food waste just a little bit, plus it’s an inexpensive and healthy alternative to store-bought broths that can be filled with sodium! A good, high-quality stock is one of cookings worst kept secrets, and one of the simplest things to make. A staple of French cooking, stock, whether it’s the chicken, beef (veal), fish, or vegetable variety, is one of the most underutilised ingredients in todays home kitchens. Most home cooks will use canned broth or the dried concentrate powder. These products, while convenient, are often very salty and lack many of the health-boosting benefits a good homemade stock has. Besides being useful in the kitchen, making your own chicken stock or any other kind of stock, is a great way to reduce food waste and use all parts of the animal. Yes, it can take several hours to properly make a stock start to finish, it is well worth the extra effort though and I will walk you through how to make this simple chicken stock recipe. Waste not, want not. How many times did I hear this growing up? Countless! Making your own Vegetable Stock from Kitchen Scraps is a perfect way to utilize perfectly good ingredients that would have ended up in a landfill! Do you know How To Grow Green Onions from Scraps? Well, we’re going to share how today! It’s super simple, and you’ll get fresh green onions from a food scrap you’d usually throw away. Are you wondering how to repot plants and regrow celery? I love having a garden and indoor plants but I don’t always give them the attention they need. Several of my houseplants need repotting. They are too big for their current pots, and there isn’t enough nutrition in the soil for them to be happy. My houseplants are all in different rooms so I forget about them. I repotted them with new soil, in larger pots, and created a centerpiece. Have you ever wondered how to grow your own avocado tree? I know I love growing plants outside in the garden. We have several fruit trees as well as vegetable and flower gardens. Watching things grow is so rewarding. When the kids were little, they had fun helping me out as well. But, we had never tried to grow an avocado tree! OMG I WOULD LOVE TO GROW MY OWN AVOCADO TREEE!!!! THAT sounds like the most amazing idea EVER! Love this post. We all can find ways to cut down on waste in the kitchen. Cooking great and saving money. It’s a sad fact that every piece of plastic we ever produced still exists. I love your zero waste mentality! I try to eliminate waste as well. Thanks for the awesome tips! Avacado tree omg yes yes yes !! Plastic is really the most disgusting thing. It will stay on earth 1000’s of years after we all are GONE. I try every time to carry my own cloth bags when I go grocery shopping. Try to use them as less as possible. Reducing waste is so important in the kitchen & out! My mom will love your ideas. She hates food waste. Your idea will be helpful for my mom. Thank you for all !! These tips are wonderful! This is what I love about blogging , being able to use your platform to influence and educate and What a relevant and timely post to celebrate Earth Day! I could definitely find ways to keep and use some of the dough that I have made to prevent it from going to waste. This sounds like it would be a very helpful way to reduce waste in the kitchen.